I’m finally getting a scarf done for Special Olympics New Jersey. The deadline has been extended through 4 February, so I’m hoping I can get at least two done by then. This is the Summer Shimmer Scarf pattern from the Treasures Scarf I was working on previously. I really liked the stitch and how easy it was, and yet it came out with this interesting pattern. And since I had to get started on a scarf for NJ, I decided to use the same pattern, this time holding the two strands of yarn together (for a quick knit as well). The pattern shows up pretty well, even with two different colours. I plan to make a few more scarves in this pattern with the other colour combinations for the remaining states with February and March deadlines. 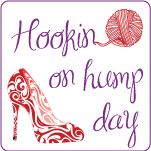 Come on over and join us on the Facebook or Ravelry group page. This entry was posted in Colouring With Yarn, KC4-SO 2013, Knit, Knit & Crochet for a Cause, Scarf and tagged 2013 scarf project, 2013 Special Olympics, iPhone photo, iPhoneography, KC4-SO, knit, knitting, scarf, scarf project, Special Olympics, Special Olympics scarf project. Bookmark the permalink. Great idea! What size needles are you using? I’m using size 10/6mm needles. It works up pretty fast with big needles, but comes out a little loose. Either way, it looks good. Thanks for visiting.